Awards Show Party Bento Boxes. This year I’m extra excited for awards show season because I’ve actually seen a ton of the movies that were nominated. Thanks to a few extra weeks of pregnancy, we hit the movie theater quite a few times since sitting and eating were about all I could physically manage in the activity department. Since then we’ve been knocking off more movies from the couch with a newborn keeping us close to home most nights. I take awards show viewing pretty seriously, getting myself set up with a laptop and phone for reviewing red carpet looks and tweeting my expert analysis (you know, from my fashion throne wearing a top knot and yoga pants). 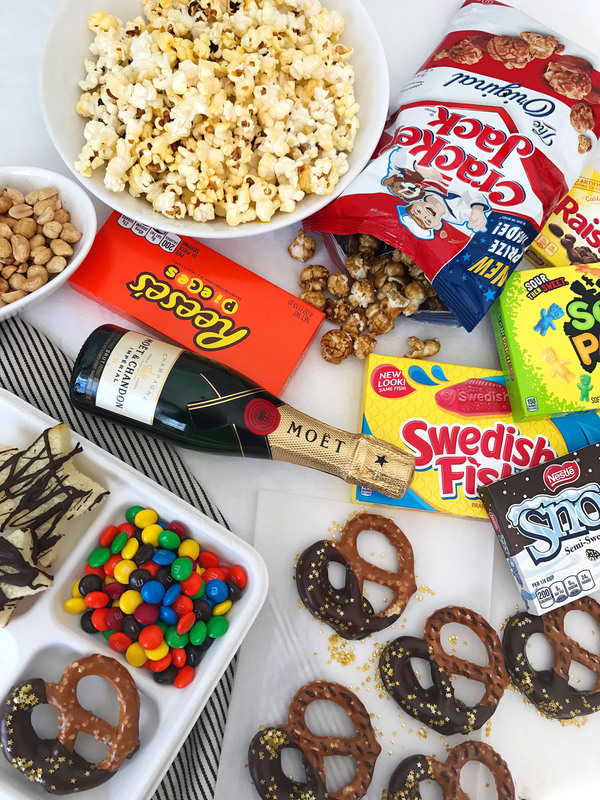 I also make sure I assemble awards show snacks with the same discerning eye I give to reviewing couture ball gowns – the snacks are essential fuel for viewing! Keeping with the movie theme, I love to take classic movie theater snacks and put them front and center for my award show menu. 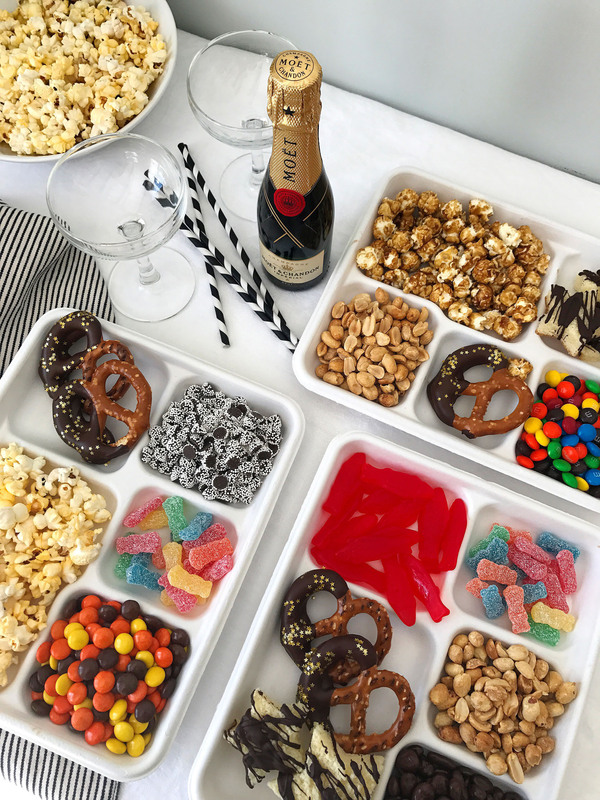 This year, I wanted to give the presentation a new spin and decided to make bento-box style movie theater snack trays. 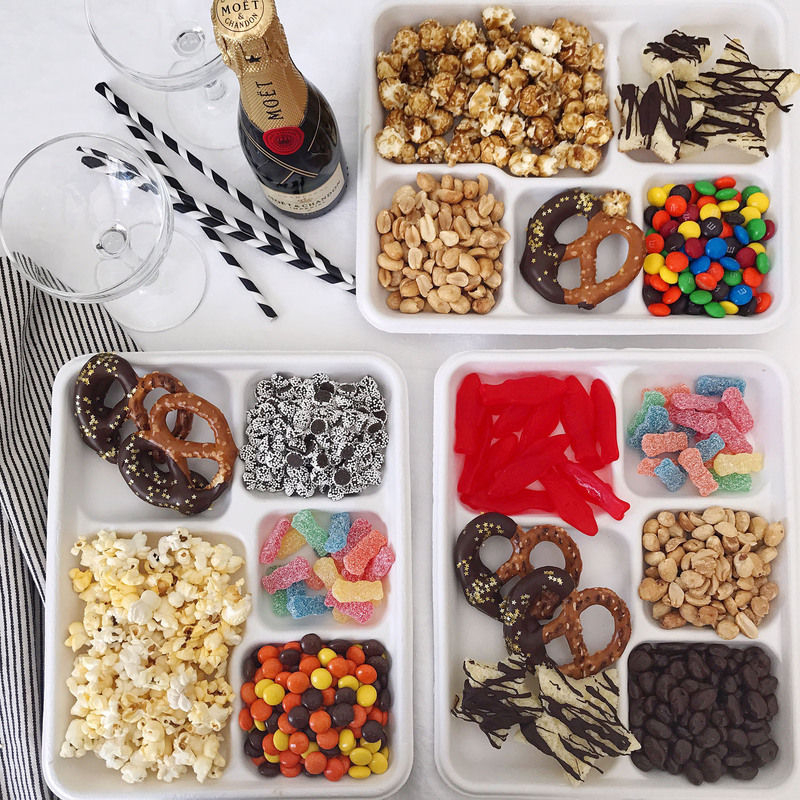 I used Chinet® Classic White™ compartment trays to sort out little bites of everyone’s favorite movie theater treats. In some of the larger compartments I added buttery movie theater popcorn or sweet caramel covered popcorn. 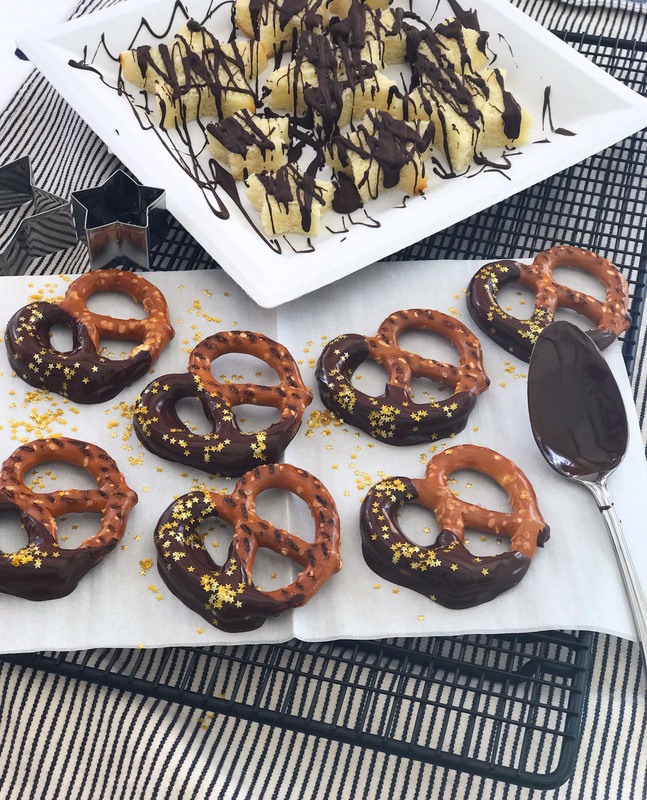 Each tray got a chocolate covered pretzel that I dusted with edible gold star glitter, or a slice of chocolate drizzled cake that I had stamped out with star-shaped cookie cutters. Then I filled in the smaller tray compartments with an array of my favorite movie theater candies – Swedish Fish and Sour Patch Kids for colorful gummy candies, and Reese’s Pieces, M&Ms, Raisinets (my favorite!) and Snow Caps for chocolate-y options. The bento-box style trays are a fun way to get your guests involved in customizing the compartments with their favorite candies and snacks. 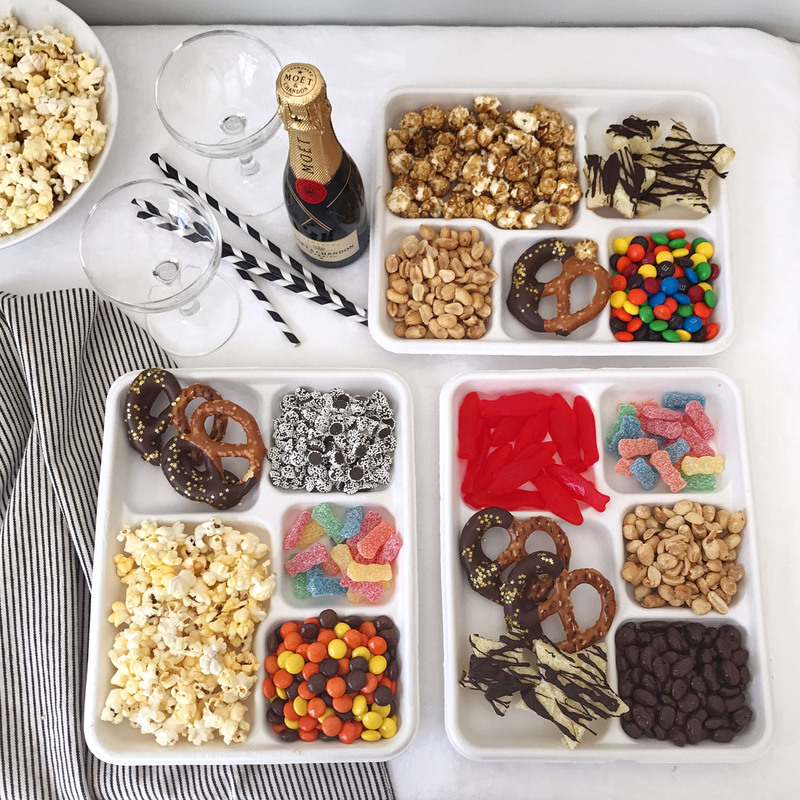 Each tray is like an individualized movie-theater treat tasting-plate! 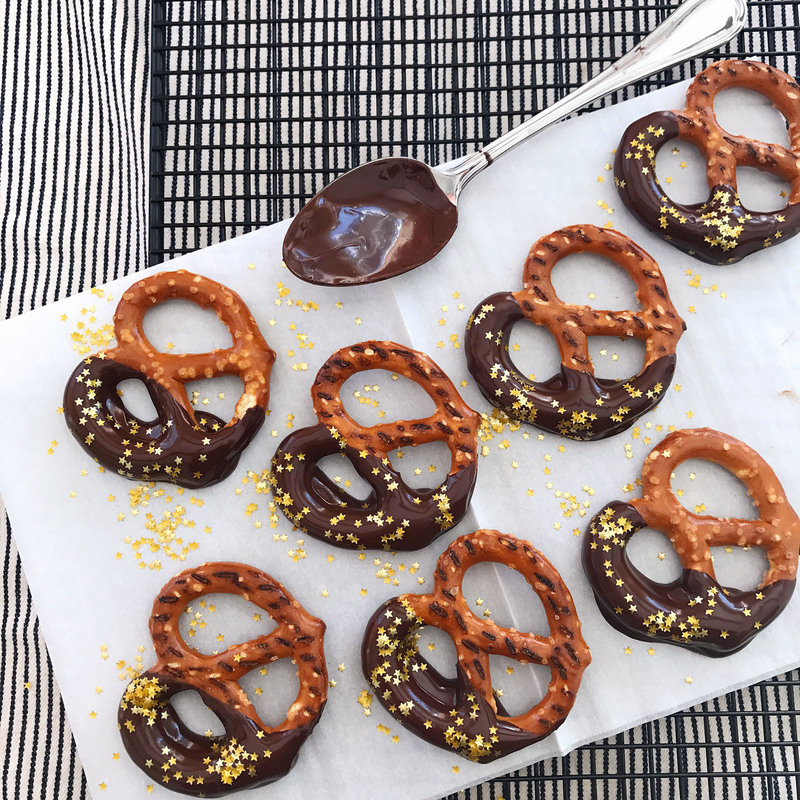 Once you’ve filled them up with your favorite flavors, it’s ready to nibble on (paired with a glass of bubbly champagne!) while watching the red carpet unfold. Blood Orange Ginger Cocktails. Wild Rice Winter Harvest Salad. 5 Responses to "Awards Show Party Bento Boxes." What a creative idea for these. I never would have thought to make it movie night w/ these. Thanks for the inspiration! A new twist on a standard item! I think I may have get invites out for an Oscar Viewing Party now and have these handy! I host for every awards show and am always looking for new ideas. 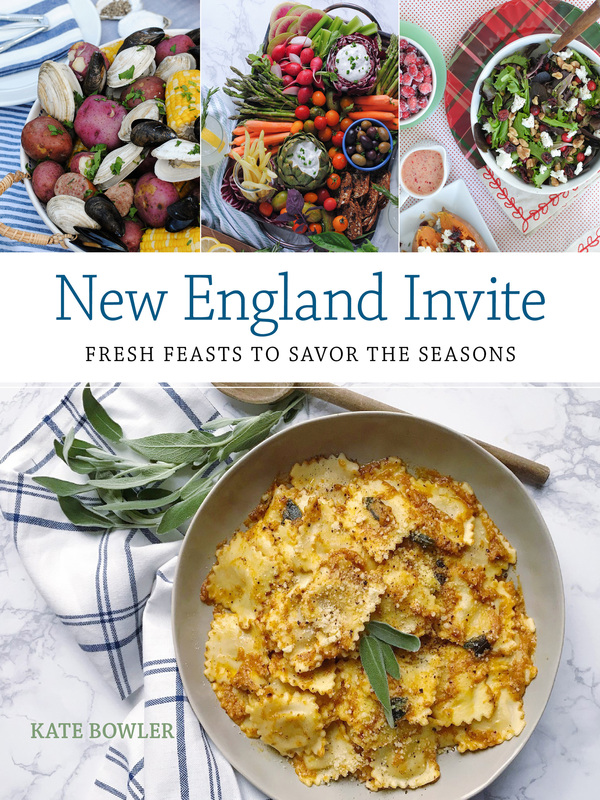 This is such a fun way for people to grab a bunch of tasty treats, without having to reach across the coffee table all night! So cute!! What a great party idea. 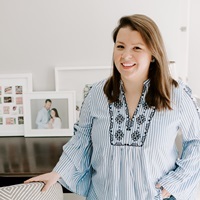 Kate, this is the cutest idea ever for watching the award shows- or just binging a new tv show! Thanks for the inspo, girlie!